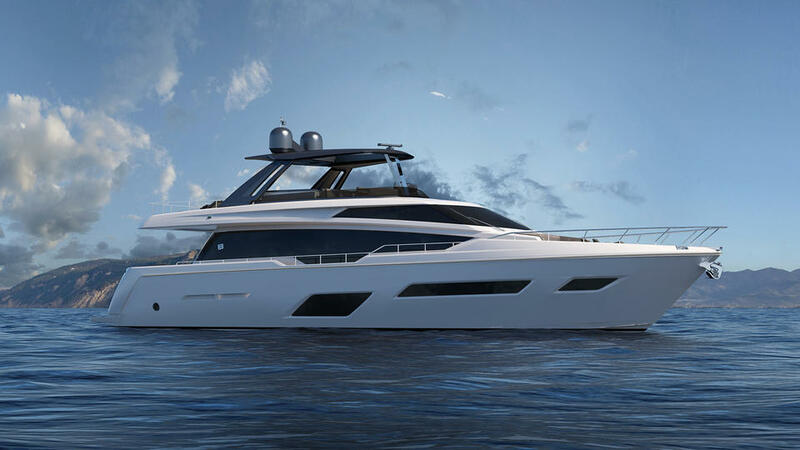 Italian yard Ferretti Group has revealed the first details of its new Ferretti 780 range of 24 metre flybridge yachts, which will go into production in January 2017. Designed in collaboration with Studio Zuccon International Project, the new all-GRP yacht features an aggressive aerodynamic profile, rectangular portholes and sleek lines. Ferretti Group has placed a particular emphasis on outdoor living with the 780, which features a beach club area in the transom and a vast foredeck seating area, complete with two sofas and a large central sunpad.Triple glass patio doors lead into the main deck saloon, which is fitted with armchairs and a C-shaped sofa. Cutaway bulwarks mean that plenty of natural light can permeate through to this key relaxation area. Further forward, a separate dining area provides seating for all eight guests. All accommodation on board the Ferretti 780 is en suite and below deck, including a full-beam master cabin, complete with walk-in closet and a separate on-board office area. Two doubles and a twin cabin complete the guest accommodation, while the separate crew quarters aft is large enough for a staff of up to three people. Power comes from a pair of 1,400hp MAN diesel engines for a top speed of 28 knots and comfortable cruising at 24 knots. Optional extras include a stabilisation system and a 300hp engine upgrade, which makes speeds of more than 30 knots possible. Other projects currently under development at the Italian yard include the 26 metre Ferretti 850 series, three of which have already been sold.